Aarrgghh Woof! The Dog Is King Of The Castle So Why Not Have Him Be Captain Of The Pirate Ship. 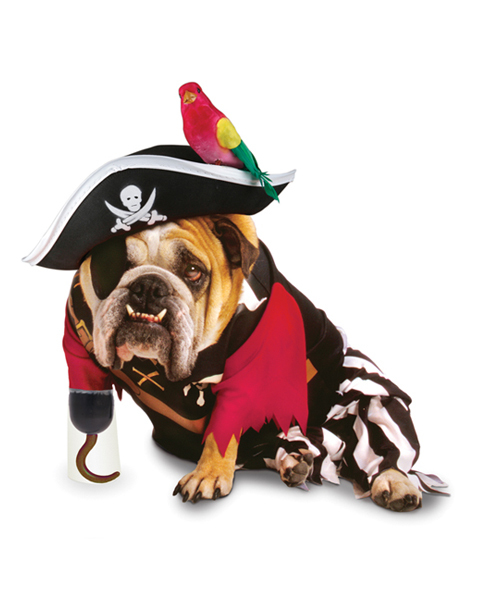 Our Pirate Dog Costume Would Look Great On Any Dog, Not Just Bulldogs. The Costume Comes With A Pirate Shirt, Black And White Striped Pants, A Sleeve That Looks Like A Hook And A Pirate Hat. This Will Make Even The Sweetest Dog Look Like A Tough Guy. * Includes Shirt, Pants, Hook And Hat. Available Sizes: Available in sizes Small, Medium and Large.